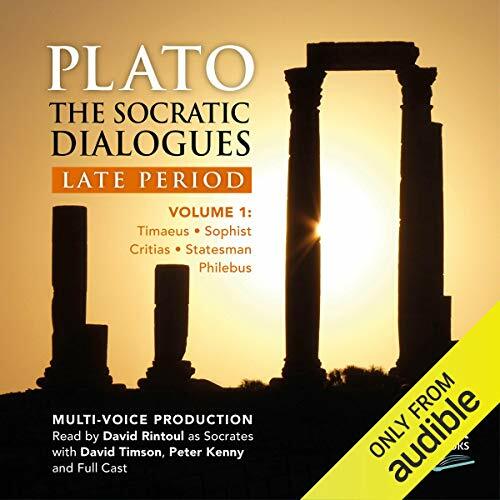 These five very different Socratic Dialogues date from Plato's later period, when he was revisiting his early thoughts and conclusions and showing a willingness for revision. In Timaeus (mainly a monologue read by David Timson in the title role), Plato considers cosmology in terms of the nature and structure of the universe, the ever-changing physical world and the unchanging eternal world. And he proposes a demiurge as a benevolent creator God. Though unfinished, Critias (read by Peter Kenny) is a fascinating document in which Plato tells the story of the strong island empire of Atlantis and reports of a more ideal Athens in the past. In Sophist, Plato questions the nature of the sophist and how he differs from a statesman or a philosopher. In Statesman, Plato questions his earlier projection as the philosopher king as the ideal ruler (The Republic) and considers the importance of other issues such as political awareness. In Philebus, Plato's spotlight falls on hedonism, the life of pleasure - and the balance offered by wisdom and intelligence. These works of Plato were meant to be performed. Ukemi has produced a perfect production for the audible obsessed. I had listened to Plotinius’ ‘The Enneads’ another Ukemi perfectly produced production and I realized that ‘Timeaus’ was its foundation so that I downloaded this volume in order to better understand ‘The Enneads’. It’s easy to deduce that ‘Timeaus’ and ‘The Enneads’ are two of the most important books ever written since they form the foundation of neo-Platonism and are why one can rhetorically pose the question ‘what does Jerusalem have to do with Athens?’. All one has to do is read Augustine or Boethius or my favorite of all the doctors of the Church, Thomas Aquinas in order to see why these works of Plato are still relevant today. Not only are these dialogs relevant they are actually a fun listen when they are performed as well as they are here. The ‘Sophist’ gets at ‘being’ and ‘not being’ better than even Martin Heidegger does, and the ‘Philebus’ gets at why wisdom trumps pleasure. (I’ll give a hint: truth, the moral, and beauty are primary for the optimum human experience! Of course, each category corresponds to Kant’s three critiques, all available here at Audible). Good argumentation never goes out of style. Plato will say through his Eleatic stranger, that those who think they know but are wrong constitute one of the worst of the epistemological errors. These dialogs are an antidote for those who believe that alternative facts exist anywhere but in their own fevered fancies. Why do most bloviators on my TV seem to have never read books like this one, but always seem to act like they know things that they don’t know and their arguments are never as sophisticated as the ones presented over 2300 years ago? For one audible credit they could learn more from a book like this than from a year of watching themselves and others like them blabber on with their foundationless arguments. I found this translation very suspicious and does no good for serious readers. It appeared to have been translated in an unscholarly manner. Or perhaps it was just an alternated English translation because I don't see how certain word chocie could follow from the Greek text. The performance was good tho, really wish they had adopted a more scholarly translation. great story best thriller evar hope the author will continue this series! What character would you cut from The Socratic Dialogues: Late Period, Volume 1?